Thanks to Lee McCormack at LeeLikesBikes.com for all the photos and updates. For more information, photos, and regular updates, visit his site. Or, visit Glenn Bell's Bitterbrush Cycles blog by clicking here, or the link on the right side of the page. The rock sections provide a range of lines, from super easy to pretty darn tricky. 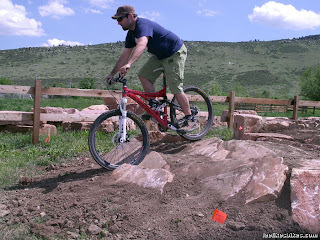 Glenn Bell, owner of Bitterbrush Cycles, tests out the course. 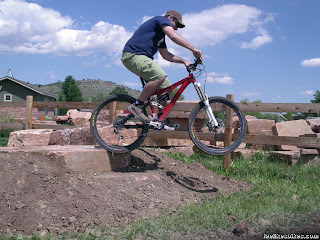 - More super-pro jump shaping thanks to Brandan. - Left Hand will start building the technical climb/descent. - Start placing the various jumps and rollers, as well as the pump track. Massive dig/ride session. Most of the dirt should be placed. I hope we’ll be doing final shaping and testing. - We’ll start at 9 a.m. and go all day. Bring any tools you have: shovel, metal rake, tampers, McCleods, skid steerers … helicopter parking is available. - Bring your bike!!! We need to burn in the lines, my friends. The rock lines are rideable now; the trick jumps will be ready tomorrow. 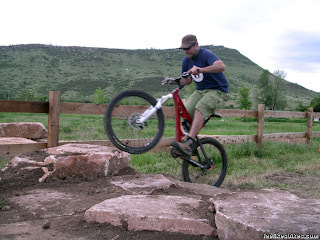 - Lyons Bike Park is right next to Bohn Park in Lyons. Google map. The growing list of rock stars: Doug, Jake and Scooter from Left Hand Excavating; Raul from Blue Mountain Stone; parks director Dave Cosgrove and the entire Lyons work crew; Glenn from Bitterbrush Cycles; Brandan Turman; Brian, John, Dominic from the Yellow Designs Stunt Team; Sam, Chad, Nick, Ian, the list goes on … and The Wife, who brought me lunch and looked hot. For something like this, you need equipment and love. And we have both.